Our weather is stuck in a very annoying loop. Spring birds are coming back, winter birds are still here and every, single, confounded weekend this month it has snowed for two days. As a result, my birding has been limited to anxiously looking for spring migrants in the yard. We haven’t taken any birding drives this month, but scrolling back through previous ‘spring’ posts on Bird Canada, I found something I wanted to share. With the release of Richard Crossley's magnificent Raptor ID Guide, everyone is keen to see the returning birds so we can practice our skills. 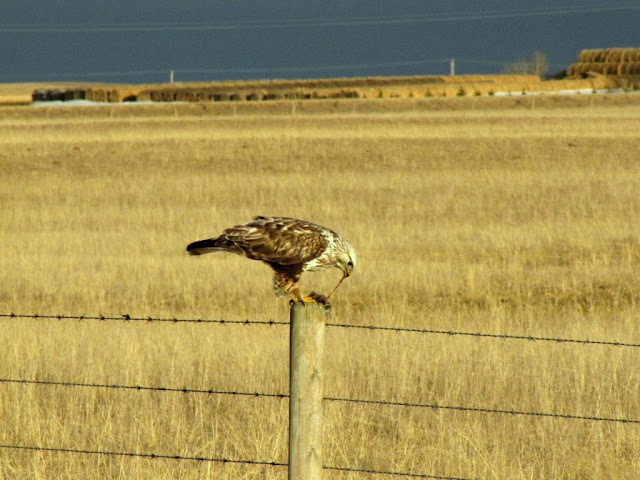 In our area, many of the raptor sightings are of birds perched on farm fence posts, and it can be tricky getting close enough for a good photo before they lift off. 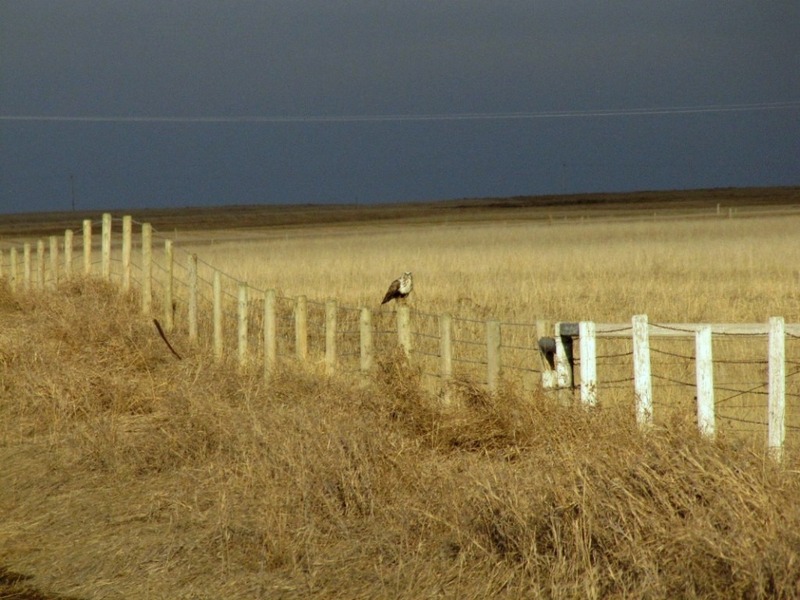 During a previous April (when we didn't have winter every weekend), we took a birding drive south of the city. Rough-legged Hawks were still here, but the Red tailed, Swainson’s and others were returning. A biologist friend had told me how to get close to raptors on fence posts beside the road. You stop when you first see them, and remain there for a few minutes. Then you creep the vehicle forward about 10 yards, and stop and sit again. You slowly repeat this process until you're close enough for a decent picture. It sounded like a good idea, so we tried it. 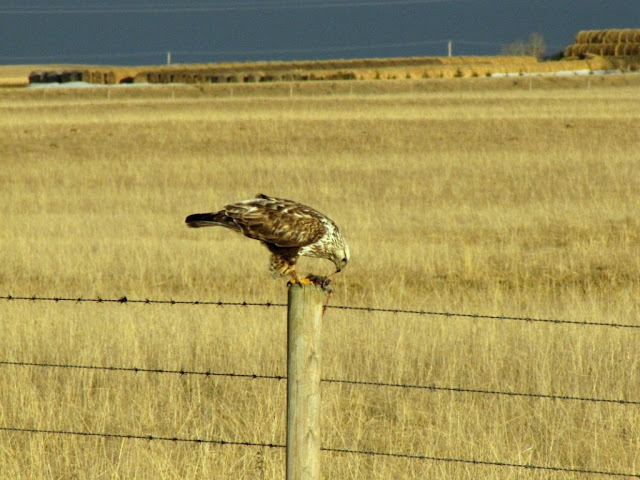 The first raptor we saw was a Rough-legged Hawk, and this was our first view. Slowly creeping down the shoulder, we got closer. At one point he hopped down from the post, and I thought we had lost him. Imagine my surprise when he popped right back up again with dinner. Either this creeping-forward thing really works, or we found a completely unconcerned roughie. We ended up sitting right beside him, and I took a couple hundred photos plus a few videos. As with all birding techniques though, there are exceptions. Adult Snowy Owls, Prairie Falcons, Merlins, Peregrines and Bald Eagles could care less if you drive up right underneath them and stop. Juvenile snowies require creeping. 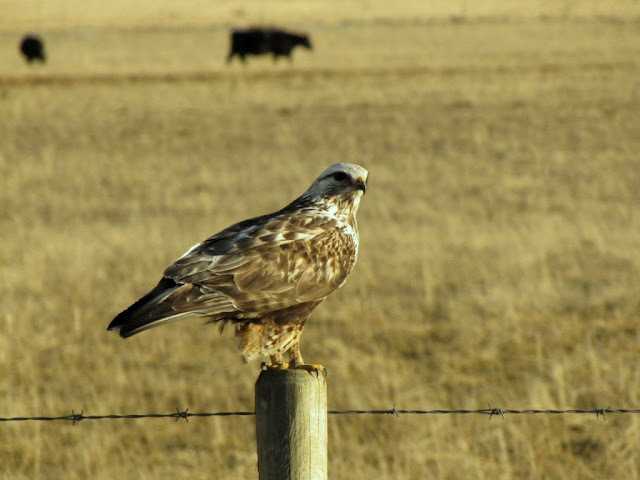 Swainson’s Hawks really don’t give a toss if you stop right in front of them. There was no creeping involved with this guy. We just drove up and stopped about 10 feet across the ditch. He was so close I wasn't even going to take a picture, but then I just had to snap a few. 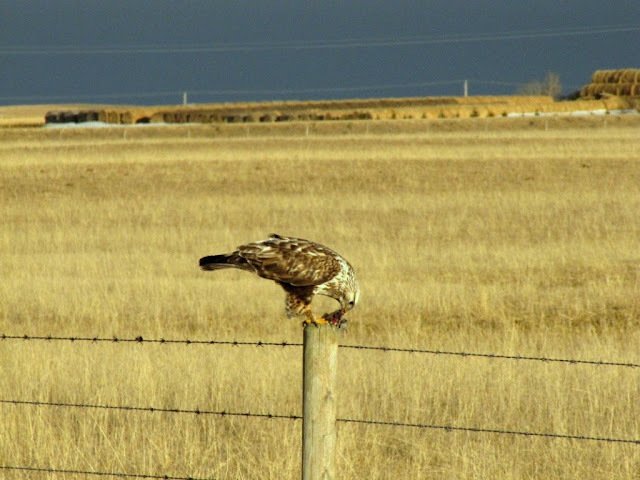 He was still calmly perched there in the setting sun when we drove away. Ferruginous Hawks can go either way, but this youngster we came across last summer was too busy trying to cool himself off to pay any attention to us. This is the spot where I would like to produce a stunning photo to show you the results of our creeping up on a Red-tailed Hawk. 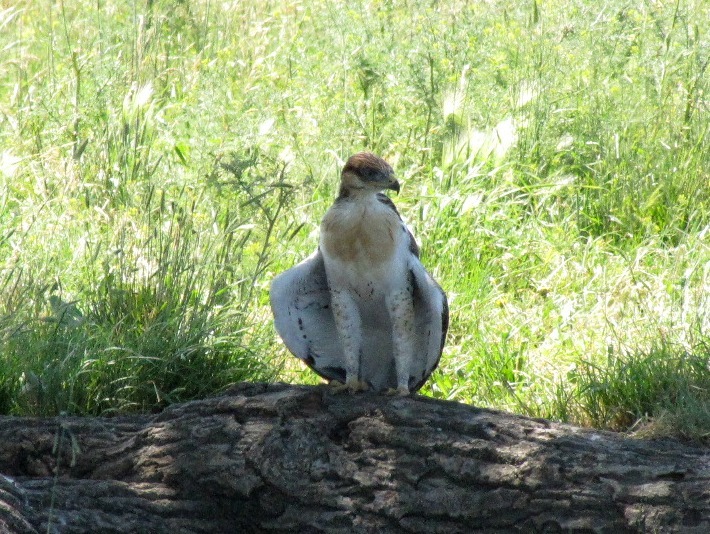 So far, our camera experience with red-tails is “Oh look there’s a ha...never mind, he’s gone.” This is doubly annoying because when I wasn't birding with a camera, I saw Red-tailed Hawks everywhere. I've considered (briefly) taking a birding drive while leaving my camera at home to test this theory, but doubt my system could stand the strain. Love these raptor pics! Up close & personal with hawks! Delightful post just full of wonderful pictures that leave me full of envy! I purchased the same remarkable book, what a treasure trove of images! Your finds are magnificent and wow, to get so close to any raptor, amazing! Awesome photos! I was lucky enough to see a red-shouldered Hawk hunt for frogs today. When I went to take a picture, I found I left home without my CF card. won't make that mistake again! When I worked for the NPS, I had a volunteer meet me in the a.m. for the reptile and amphibian inventory work. He said, "I'm in a hurry today, so I brought my camera so we won't catch anything." And so we didn't. =) Smart man. Wow, this creeping method really does work! Your photographs are fantastic! What a pleasure it is to view these stunning raptors close up. 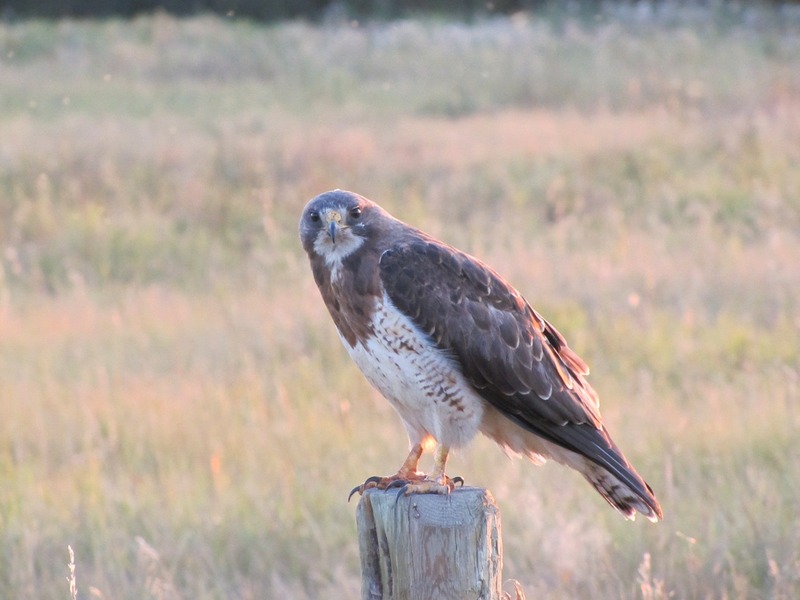 I hope your weather improves soon so you can creep up on some Red-tails.